SHOES-n-FEET franchise business opportunity. Free SHOES-n-FEET® business franchise information. The shoe industry is a multi-trillion dollar industry. About 80% of people will experience foot pain at one time in their lives. Well fitting and supportive (good for your whole body) shoes are hard to find in today’s market. We hit the niche that no one else does- we are a Podiatric shoe store, NOT a pedorthic shoe store. We close the loop between the medical community (primarily Podiatrists), their patient and the shoe store. Our business is referral driven. 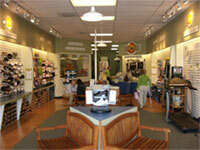 90% of our business is from medical referrals, personal referrals and repeat customers. We do not make custom orthotics-we refer to Podiatrists, therefore, we support Podiatry rather than compete against it. We have spent 8 years developing and implementing clear systems and procedures for our success. We do not compromise our standards or brand. We have a strong continuing education program so that each store continues to grow and the employees continue to grow-also resulting in high employee retention. Make an Investment in a Business Early in its Life Cycle! Take Advantage of the Vast Growth Potential in the Industry and Market! Five Generations of Innovative Shoe Industry Experience! Greater voice – As an early franchisee, your opinion and input is highly valued. To learn more about the SHOES-n-FEET retail franchise opportunity, simply complete the form below.